We shared the limelight. Very Grace Kelly but we also know that Audrey was a great lover of her pearls. For a simply stunning white pearl necklace in an over 9mm pearl strand, look no further than this. Shown here as a slightly longer version of an average pearl choker we can make this into any size necklace required and so please just ask us. Although the caps in the necklace and earrings are sterling silver we electroplated them with 24ct gold. The clasp here is not sterling silver but we adored the texture of it and had to use it. The white pearl drop earrings are 10- 11m round pearls that really look special when worn. 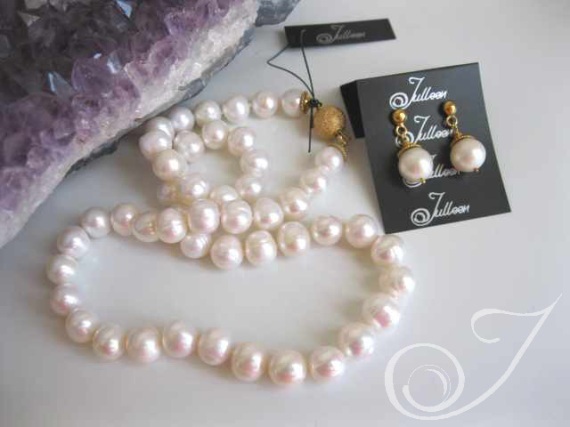 This is a seriously exceptional pearl jewellery set and made to last for a lifetime of wear. My Bridal Jewellery congratulates any purchaser who makes this jewellery set a start of their pearl collection, as this quality, at this price is not easily found anywhere else. We called our necklace after Audrey but we just had to add a picture of the divine Grace Kelly wearing her much loved pearl choker. Similarly we have a entire range of 6x stranded pearl bracelets all named after Grace called Kelly. Please feel free to browse the Kelly collection bracelets as we are sure you will find them more than a little impressive. Please let us know. Sophia Earrings or contact us and quote product code BCH008 for the necklace.